My life is now complete - Strava will allow emojis in the titles of my activities. My trash company is urging me to download their app. I have to draw the line somewhere, and this is where it is. A good list of weather related apps for your smartphone. New from the ARRL, a QST app for iOS devices. I'm using it on my iPhone 5 and the screen is too small to be usable. I think it would work fine on my iPad. ARRL members using Apple iOS mobile devices--iPhone, iPad, and iPod touch--can download a new dedicated app to access the digital edition of QST. The app allows ARRL members to read QST online or choose to download individual issues of the journal for offline reading. Free: The QST app is free in the Apple App Store. 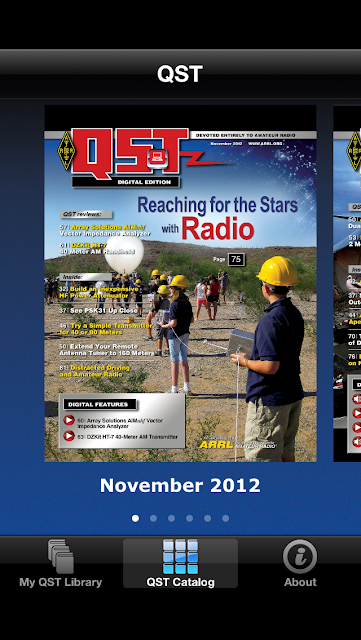 You must be an ARRL member to access individual issues of QST. QST Catalog: Browse all available digital issues. My QST Library: Download issues of QST directly to your device for offline reading. Pretty fun app, but you can't quite do this. Google Tap comes one step closer to reality with this iPhone Morse Code Twitter app - TeleTweet. incorporates fixes and some new features for DXers. "This is our first release since obtaining the source code about 90 days ago,"
us QA the builds as they're developed." bug fixes, added rig support, and a few enhancements. high-expectations for HRD in the future." In addition to the Code Year project, Lifehacker has their Learn to Code: The Full Beginner's Guide available in 5 parts. I always learn better when I have multiple sources. Different books/courses/instructors complement each other and help me fill in the weak spots.